Curtis Industries introduced a utility vehicle plow. The plow, which comes fully assembled to dealers, is powder coated for corrosion resistance and features a 72-in. x 19-in. adjustable full trip moldboard with a 6-in. cutting edge. Designed with a 48-in. trip frame, the attachment comes equipped with a moldboard, A-frame, lift frame, hydraulic pump and motor and angle cylinders. It also comes with skid shoes, high-visibility blade markers and a jack leg. In addition to this, the plow’s hydraulic lift and angle controls begin working within two seconds, says the company. Its hydraulic reservoir is contained in a removable metal housing above the mount frame, which gives operators easy access to hydraulic fluid, hoses and the coil valve. The plow’s custom mount kits are made for a number of vehicles, including the John Deere Gator XUV; Club Car XRT 1550/ Case; Polaris Ranger XP 900; Bobcat 2200, 2300, 3400 4×4; Case Scout and Scout XL; Husqvarna HUV 4421 and 4421XL; and the New Holland Rustler 120 and 125. 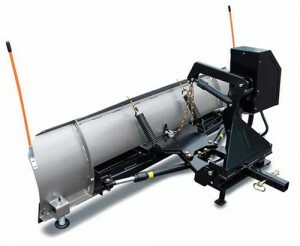 The company also offers an optional snow deflector and rubber cutting edge for the plow.